Good news: despite the lack of recent posts, I am happy to report we are still alive. Better news: today we are walking around say “yo ho ho” a lot. Not because Christmas is right around the corner – it isn’t, and that first H is a Y, thank you very much – but because August 16 is dedicated to probably the tastiest liquor around. 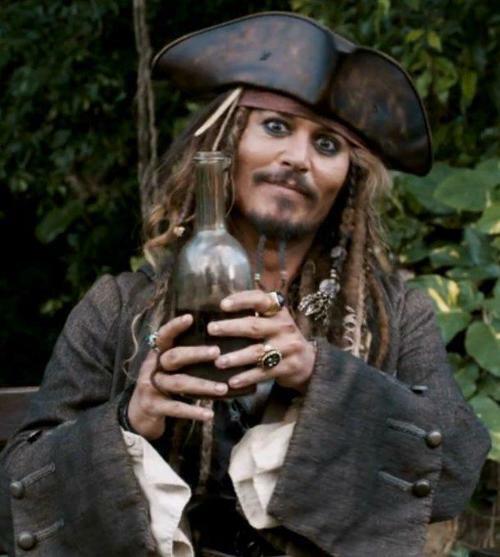 It’s National Rum Day! Yo ho ho and a bottle of yum is more like it. The word rum is believed to be derived from the last syllable of the Latin word for sugar, saccharum. Or it might come from the Romanian word rum, meaning “strong” or “potent.” Both explanations make sense to me. Interestingly enough, rum was originally a byproduct of sugar cane; it’s actually fermented molasses, which occurs during the sugar refining process. Nobody knew what to do with molasses initially, and viewed it as nothing more than industrial waste. Until some whip-smart plantation slaves in the Caribbean during the 17th century discovered the molasses could be fermented and turned into a tasty alcoholic beverage. Goodbye industrial waste, hello industrial wasted! It quickly gained popularity in Colonial North America, where the first rum distillery was opened in 1664 on Staten Island. In fact, rum became so highly prized, for a while it was accepted as currency – alongside gold – in Europe. Liquid gold, if we’re getting technical. But I have my moments. 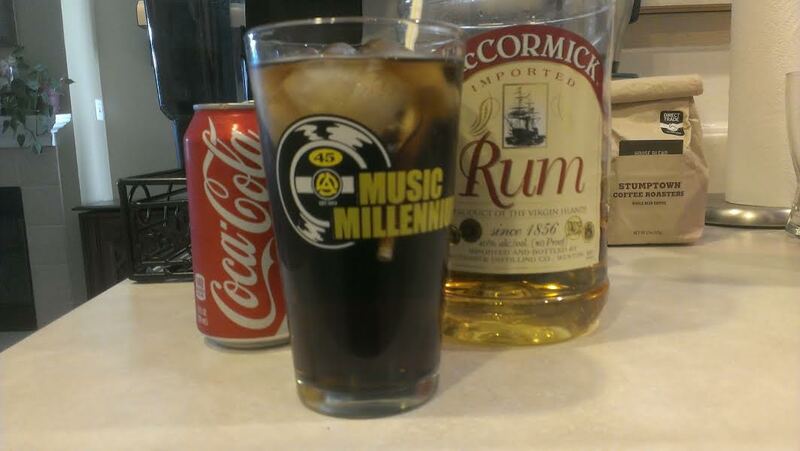 To celebrate, I had a rum and Coke. And also a shot of the rum, straight up. Bottoms up! February 8 is National Molasses Bar Day! If your first reaction is “What the heck is a molasses bar? !,” you are not alone. Tara and I wondered the same thing. Turns out it’s sort of like a brownie, only without the chocolate. Which makes for a pretty pointless brownie, if you ask me. One website describes molasses bars as “a vintage favorite brought back to life” and mentions visits to grandma’s house. Neither of my grandmothers ever made molasses bars, so I was really in the dark on what they were, but there are enough recipe links online to be able to cobble something together, which is exactly what my sweet cobbler-slash-baker, Tara, did. The Great Molasses Flood of 1919. Molasses is really good when it’s turned into rum, but is too richly flavored to slurp right out of the bottle by itself. Trust me on this. When sugar cane or sugar beets are processed, the sugar crystallizes and turns into a thick syrup. This is molasses. The word comes from melaco, Portugese for honey. 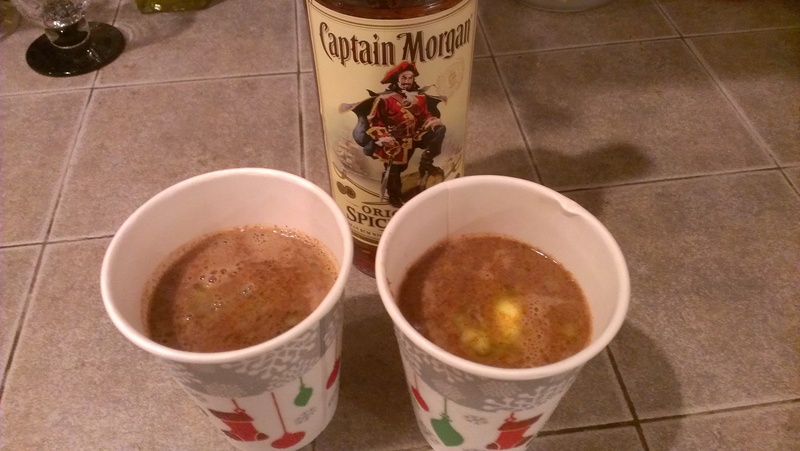 Christopher Columbus introduced molasses to the Americas when he brought sugar cane to the West Indies in 1493, and it quickly became an important trade item for the early Colonists, who used it to bake gingerbread and taffy when they weren’t getting plastered on rum. 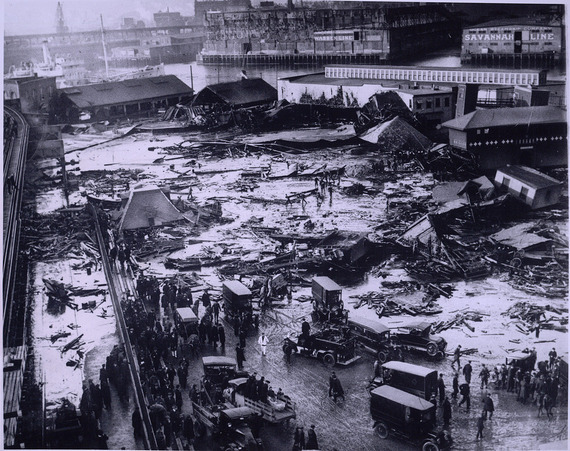 Molasses may be sweet and sticky, but it is also deadly: in 1919 a tank of molasses at the Purity Baking Company in Boston exploded, generating an 8′ high sticky flood of hot molasses that traveled through the north end of town at 35 mph. Known as the Great Molasses Flood, it ended up killing 21 people and injuring 150. What a horrible disas-tah. Local residents claim they can still catch a hint of molasses in the air on warm and windy days. Now, that’s morbid. And what a horrible way to go, smothered by thick, hot syrup. Kinda makes you feel bad for pancakes. Anyway. Molasses bars! Tara made them last night, and we enjoyed them with coffee this morning. But “enjoyed” is a strong word, because honestly, neither of us were blown away. 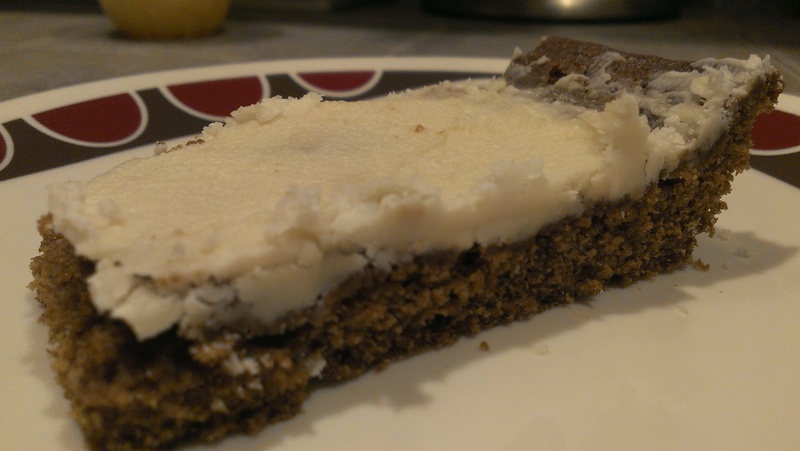 They taste sort of like spice cake, and were awfully crumbly. And neither of us is particularly keen on the flavor of molasses anyway. But hey, that’s another one in the books!